Guernsey FC drawn away in the quarter-finals of the FA Vase. 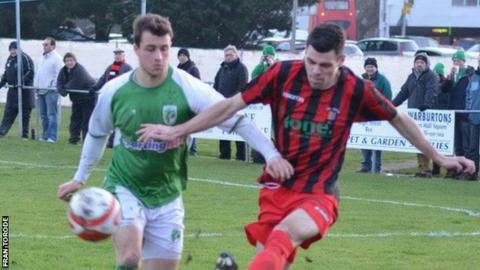 Guernsey FC will have to wait to find out their opponents in the quarter-finals of the FA Vase. The Green Lions have been drawn away from home in the last eight, but could still face any one of three teams. Fellow Combined Counties League Premier Division side Hanworth Villa face Walsall Wood in a rearranged fourth round tie, with the winners to face Runcorn Town in the last 16. Whichever side eventually emerges will then face Guernsey on 2 March. The island side, who reached the quarter-finals with a 3-1 win at Spalding United, have only been drawn at home twice in seven Vase ties so far, playing Farnham Town and Erith and Belvedere at Footes Lane. "It's great coming to new places, we love it, but the travelling is hard," top scorer Ross Allen told BBC Guernsey. But he added: "Whoever we get in the next round, home or away, I think we'll be confident."